Matt Morris directed the Emmy-nominated documentary short called Pickin' & Trimmin'. It's about a barbershop in a small North Carolina town where the barbers had cut hair for six decades and every weekend bluegrass musicians would come from all over to jam in the back room. It was one of 58 films chosen from 3,500 entries to premiere at Aspen Shortsfest and had a great festival run after, screening at more than 60 festivals around the world. It won 8 awards, including Best Documentary Short at the Florida Film Festival and Woodstock Film Festival. Real barbershops are getting harder and harder to find. One that caters to men and also gives hot straight razor shaves to accompany a discussion on any topic under the Sun. Sharing the local news and gossip and keeping up using the old social networks was part of the experience. The barbership was the social meeting place before computers, smart phones and mobile devices. The red white and blue revolving barber posts are rapidly fading from the American landscape. New unisex salons that are quick, sans the extras and more expensive are taking over to keep stride in the running step of American's fast life pace. At The Barbershop in Drexel, NC, the atmosphere is laid back, the conversation free, and the music a cut above the rest. Emmy® nominee, Official Selection of over 60 film festivals, and Best Documentary Short Film winner at the Florida Film Festival and Woodstock Film Festival. 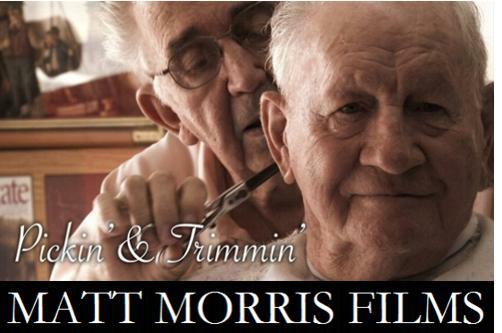 Pickin' & Trimmin' from Matt Morris Films on Vimeo. The film profiled The Barbershop in Drexel, North Carolina, where Lawrence Anthony and David Shirley barbered for decades and every weekend bluegrass musicians jammed in the back room. The film played at dozens of film festivals around the world and won multiple awards. On top of that, The Barbershop and the people in it became a very important part of my life. When audiences were introduced to the shop, many were pleasantly surprised that such a place still existed. Recently, the shop has come to a crossroads where it needs outside help in order to continue on as a place for music, fellowship, and good old fashioned fun. In late 2009, Lawrence Anthony, the head barber at the shop, passed away. His son Carroll intends to fulfill his father’s wish to keep the shop open in the same spirit as it always has been. Unfortunately, the shop has suffered from water damage and is in need of repair. Please watch the video above to see more. Director's Cut DVDs with extended scenes and music available at: MattMorrisFilms.com.